Despite what I call this as a "cheat" gravy, it does not come from a mix. The reason I call this "cheat" gravy is because is uses fairly unorthodox ingredients in what we generally know as gravy. Soy sauce and oyster sauce? In a gravy? Yes, it sounds weird, but trust me, somehow it works. With just a handful of ingredients, most of which should already be staples in your pantry, this is a fast, no-fuss dish that can easily be thrown together for a quick dinner on a weeknight. My parents often made this for my brother and I as kids for a quick supper before we were rushed off to our piano lessons or dance practices. It is no surprise that it become a go-to recipe for me when I went off to university: fast, easy, and cheap! 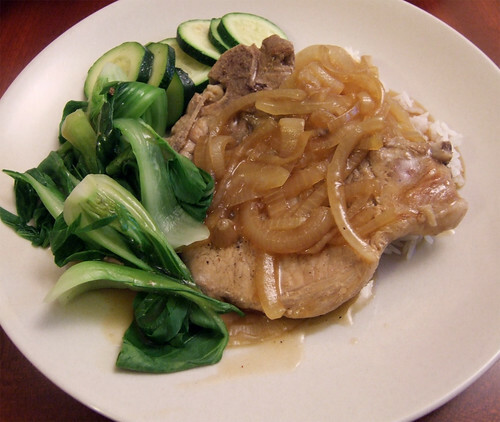 I haven't made these pork chops since graduating from university, but I was suddenly feeling nostalgic and decided to make this dish again during a weeknight. It brings back memories of my childhood, when my brother and I used to drench our rice with the gravy, which we thought was the best thing about this dish! Heat some vegetable oil in a heavy frying pan over medium-high heat. Season the pork chops on one side with salt and pepper and place them into the hot pan. Pan-fry the pork chops, seasoned-side down until a nice golden brown, about 2 minutes. While the pork chops are cooking, season the other side of the pork chops and flip. Cook until golden brown, about another 2 minutes. Remove the chops to a plate and set aside. Reduce the heat to medium, add the onions and cook until starting to soften, about 6 minutes. Add the water, soy sauce, oyster sauce and pinch of sugar. Bring to a boil and allow to simmer for about 2 minutes. Add the cornstarch solution to help thicken the sauce. Bring the sauce back to a boil. If you find your sauce still too thin for your your liking, add more cornstarch solution. Season the sauce, if needed. 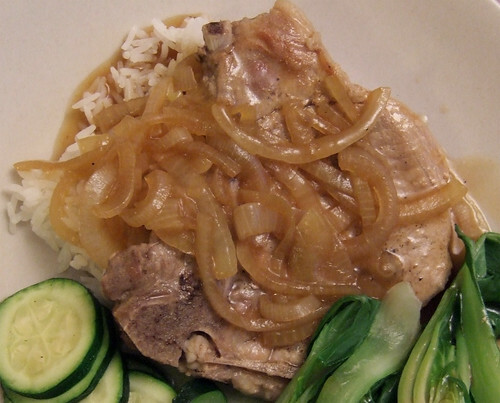 Place the pork chops back into the pan with the gravy to reheat, about 1 minute. Serve with steamed white rice.